Xenia Mayor Sarah Mays and her children, 7-year-old Freddy and 6-year-old Layla. Whitney Vickers | Greene County News The Watkins family — Emily, Andrew, 4-year-old Claire and 6-month-old Clayton — as Greene County Probate Judge Thomas O’Diam signs paperwork during Clayton’s adoption hearing. Judge Adolfo Tornichio, juvenile court judge, sat in on the hearing as adoption cases start in the juvenile court. 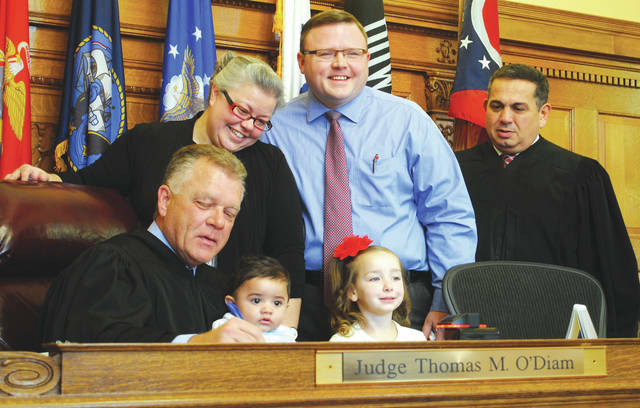 XENIA — Three local families grew Nov. 8 as Greene County hosted the inaugural National Adoption Day event at the Greene County Common Pleas Courthouse in which three adoption hearing were held and open to the public. Adoption hearing ceremonies are typically confidential. However, the three hearings held Nov. 8 were open to the public to raise awareness of adoption. According to Probate Court Judge Thomas O’Diam, Greene County sees approximately 125 adoptions per year, while a similarly-sized county typically sees 38-40 adoptions per year. O’Diam said Greene County has higher adoption rates partially because of Adoption Link, Inc., a private adoption agency based in Yellow Springs. One of the families that grew during the event was the Watkins family, of Butler County, who officially adopted their 6-month-old son Clayton. The family also includes Andy, who is the father, and 4-year-old daughter Claire. While she recognizes that there can be pain and heartache involved in adoption, she said there is also beauty and healing. Lana Penney, of Greene County Children Services, said the county organization has hosted 13 adoptions so far this year, but there are 130 children in custody of the local children services, with 35 of them in permanent custody. 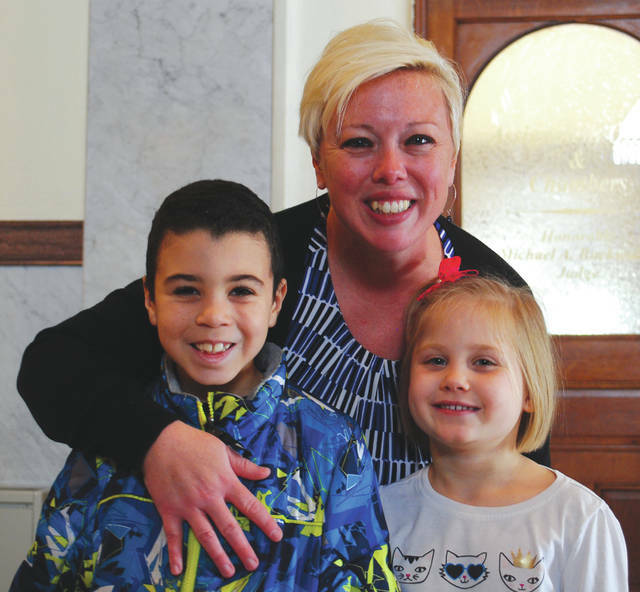 https://www.beavercreeknewscurrent.com/wp-content/uploads/sites/49/2018/11/web1_adoption1.jpgXenia Mayor Sarah Mays and her children, 7-year-old Freddy and 6-year-old Layla. https://www.beavercreeknewscurrent.com/wp-content/uploads/sites/49/2018/11/web1_adoption2.jpgWhitney Vickers | Greene County News The Watkins family — Emily, Andrew, 4-year-old Claire and 6-month-old Clayton — as Greene County Probate Judge Thomas O’Diam signs paperwork during Clayton’s adoption hearing. Judge Adolfo Tornichio, juvenile court judge, sat in on the hearing as adoption cases start in the juvenile court.